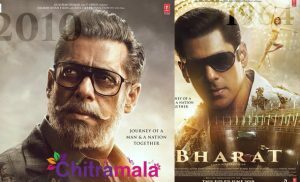 Releasing back to back three movies in the span of just three months is an impossible task for our heroes. Nara Rohit, who is popular for his perfect and fresh story selection, may be the only hero to release three movies in three months like Thuntari, Savitri and now Raja Cheyyi Vesthe, which has Tarakaratna as antagonist, produced by Sai Korrapati under his Vaarahi Chalana Chitram directed by debutant Pradeep Chilukuri. Let’s see how it works on us! 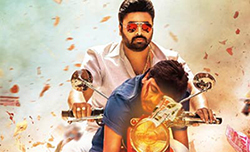 Raja Ram (Nara Rohit) is an aspiring director. He tries his best to get a producer to make his debut as he has so much belief on his talent and skills. He has a girl friend Chaitra (Isha Talwar). One day, while on a meet with her in a cafe, he narrates her the script of first film. All the people in that cafe gets super excited and are impressed. 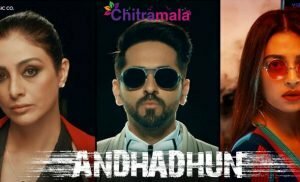 He gets a courier the very next day with money and a letter by a person, who is said to be a star director, requesting Raja Ram to write him an exciting and different love story. He accepts that offer and sends him a love story. He then gets an offer to write climax for an action film from the same director and Raja Ram accepts. When he send the climax, he gets a threat to kill Manik (Tarakarathna), who is a ruthless killer, who has good influence in ministers and MLA’s. If he don’t kill Manik, Raja Ram will be killed instead. Who is Manik?? Who is the person sending him courier?? How Raja Ram solve this problem?? forms the rest of the story. Nara Rohith as an aspiring director Raja Ram is good. He looks odd and fat. He must shed out some weight. Tarakarathna did a superb job as antagonist. But he is not used to the core. Ishi Talwar is okay. Srinivas Avasarala is good. Raghu Karumanchi and other who act as Nara Rohith friends are good. Rajeev Kanakala is good in his brief role. Siva Balaji and Ravi are okay. Story of the film is nice which is laced up with thrilling elements. Screenplay is very flat and bad. Dialogues are good. Songs composed by Sai Karthik are just okay. He did a pretty impressive work with background score. He completed compositions for 50 films in very short span of time. Cinematography is good. Editing is okay. Stunts and action are well choreographed. Tarakarathna is introduced as an antagonist in the very first scene itself. First fifteen minutes are just for his character briefing. After that our hero Nara Rohit is introduced as an aspiring director. Love track between hero and heroine and the establishing conflict between hero and villain consumes first half. Love track between Nara Rohith and Isha Talwar has nothing new and has no emotional depth but has one or two moments to laugh. Screenplay is a big let down in this half. It neither engage audience into it nor create curiosity in the minds of audience. A bit of interest is generated with the Interval bang and loses its grip with the beginning of second half. There is no change in the screenplay. It is the worst part of the movie. A flashback starts after a twist is revealed which is flat. With the ending of flashback, audience feel that movie is a wasted opportunity. Debutant director Pradeep Chilukuri failed miserably in handling screenplay and direction. To sum up, Raja Cheyi Vesthe has nothing to offer and is an example of failed execution. Watch it if you are a fan of Nara Rohith or Tarakarathna but don’t expect anything.